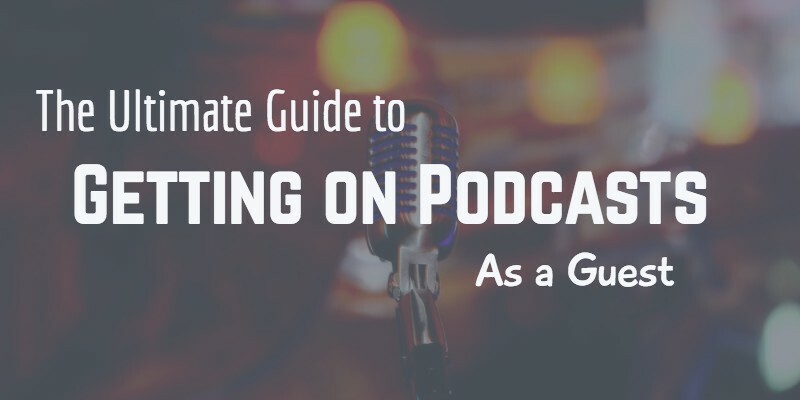 Today we’re happy to share a guest article for you on how to get on podcasts as a guest. This article was contributed by Kai Davis, author of Podcast Outreach, a guide on how to grow your audience by appearing on podcasts. Do you want to get on podcasts as a guest? What I’ve seen is that by taking the lead and reaching out to podcast hosts, you can appear on 4, 8, or 15 or more podcasts each month. If you’re waiting for podcasts to contact you and invite you on as a guest, what are you doing to get noticed? Why would they reach out to you? By proactively reaching out to podcast hosts when they’re planning out their guest lists, you increase the chances that a host will invite you on as a guest. I have a podcast — why would I want to guest on podcasts? If you have a podcast, then by guesting on podcasts similar to your own (or that reach the same target market that you reach), you can reach a new audience. That way, you can attract new listeners who you know are already in your target market as listeners. By the way, I’ve put together a free 5-day course on how to Get On Podcasts. When you sign up for the course, you’ll get a free 5-day course on how to get on podcasts that your target market listens to. You want to reach an audience that matches the audience your business is trying to reach. Who is your ideal customer? How do they describe themselves? What words do you use to describe them? You want to find podcasts that these people listen to. You want to focus on the same audience that your business is trying to reach through your other marketing channels. No matter which strategy you follow, you want to end up with a list of 5, 10, or 20+ podcasts that you want to reach out to. You’ll come back later and identify the other information you want about the podcast (host name, host email address, etc.). By the way, when you sign up for the Get On Podcasts course you’ll get a bonus template that you can use to track the podcasts that you find during your research. Use the above strategies to find 5-10+ podcasts that reach your target market. While you’re cataloging podcasts, you want to note the topic of the podcast, so you understand what to pitch them on. To write a juicy pitch for the podcast, you want to figure out three topics to pitch. Area of Expertise — A pitch about a topic that falls into your general area of expertise or knowledge about your industry. Problem → Solution — A pitch about how to solve a common problem that someone in your target market may be experiencing. Unconventional Opinion — A pitch about a strong opinion you hold counter to a common viewpoint in your target market. Each of these is a topic you can pitch to a podcast host. Once you have your pitches and your list of podcasts, you want to find the contact information for the podcast host. Take the list of podcasts that you identified and go through it, visiting each site on the list. Below, I cover 5 strategies to find the email address of the podcast host. But one thing to keep in mind: if you’re searching for someone’s email address and you’re struggling to find it (it’s taking you more than 5-10 minutes), cross off the podcast and move on. You don’t want to get stuck on searching for an email address for an hour. If you’re struggling to find an email address, move on. I typically only use Hunter, but Any Mail Finder is a great secondary tool for you to use in case Email Hunter doesn’t turn up any results. Then, Hunter returns a list of every email address they’ve found in their crawling of the internet that matches that domain. On top of that, Hunter gives you their best guess at the format for email addresses at that domain. Do they typically use FirstName@siteurl.com? FirstNameLastName@siteurl.com? LastName@siteurl.com? Something else? If Hunter doesn’t give you the direction you need to track down the prospect’s email address, then try using Any Mail Finder as a backup. You’re ready to pitch the podcast host. You’ll want to write an email that the podcast host wants to reply to. (You can learn about how to write an email to anyone and get a response in the Free Outreach Course). You’ll want to write a ‘you’ focused email that speaks to the recipient about the benefits of having you on as a podcast guest. What interesting story will their audience benefit from hearing? What new piece of knowledge can you share with the listeners? I’m a big fan of PODCAST NAME and loved the recent episode where you talked about TOPIC. Topic #1 — Short description of your first topic and the benefits to the listeners of hearing you two talk about this. Topic #2 — Short description of your second topic and the benefits to the listeners of hearing you two talk about this. Topic #3 — Short description of your third topic and the benefits to the listeners of hearing you two talk about this. Does one of these sound like they’d be a good fit for your audience? Just hit reply and let me know which topic you’d like to talk about on an episode. After that, we can work out scheduling details. Once you send an email, what do you do if the host doesn’t reply? A person with a weak ego would give up — but you don’t have a weak ego. You have something important to share. You have an important story to tell. Is what you have to share so unimportant that you’ll give up after only one attempt? By following up politely and persistently, you’re demonstrating to the podcast host that you’re serious and that you have something important to share. However, you want to make sure that you’re adding value with each follow-up. You don’t want to send ‘more and the same’ with each follow-up email. You want to add additional value. How? It’s a great episode and the audience loved it. This episode is a great example of the actionable advice and knowledge that I can share with your audience. Are you looking to fill an opening in your schedule? I’m currently booking out guest appearances for the next two months. If you’re looking for a guest, just hit reply and let me know me. Once I hear back from you, we can confirm the topic and the time. When you appear on the podcast, you want to make sure that your appearance translates into a return for you. If you have a product for sale, you don’t want to pitch it on the podcast. It’s too early in your relationship with the listeners to sell them on a product. You’ll want to focus on promoting a free course, a lead magnet, or something small and free they can engage with and get some value out of. Like this free 5-day course on how to get on podcasts! You’ll want to give an answer that directs the listeners to the resource by promoting the outcome or benefit of the resource you’re sharing. Now you’re ready for your own podcast tour! Thanks for that in-depth guide to appearing on a podcast, Kai! If any of our listeners are interested, Kai has a free five-day course on how to get on a podcast that you can sign up for. Kai Davis is an Outreach Consultant who helps educational product creators and freelancers learn how to increase their sales and grow their audience by appearing on podcasts that reach their target market. He’s the author of Podcast Outreach and The Outreach Blueprint, two books designed to teach you how to email anyone and get a response, as well as the creator of the Free Outreach Course, which you should sign up for today.